Genesis II at Deep Cove, Doubtful Sound, Fiordland. 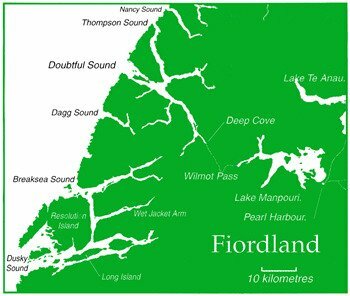 I had an opportunity to return to Fiordland by adding my name to a list for a charter onboard the Genesis II. This trip was organised by Neville Hammond. A phone call to Dougal McKay in Auckland and his name was also added to the list. Our target for this trip is the southern bluefin tuna. This large and powerful migratory fish doesn’t stray far from the continental shelf and in some places, it is within a kilometre of the shore. 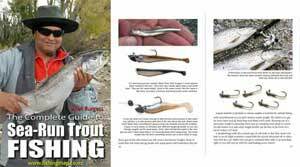 February through to May is considered the best time to seek these fish. 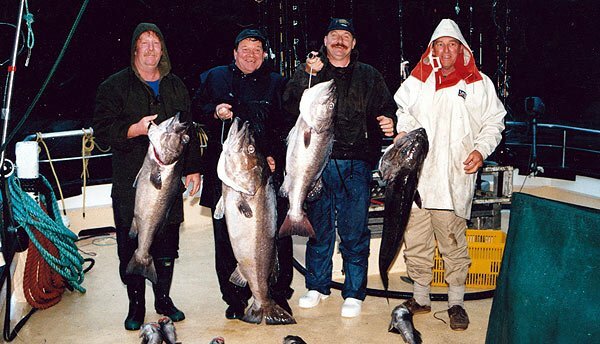 I wanted to emulate the success of Gary Bright, a stag and Steve Smith, a bluefin tuna on our last trip to Fiordland with members of the Ferrymead Fishing Club, back in April 1998. Neville wanted to sight in his borrowed rifle and I needed to re-sight mine, especially after dropping it twice on D’Urville Island. Using the bonnet of my car as a steady rest, I found it was difficult to hold it steady on a two-inch bull at about a hundred metres. After a few shots and adjustments, I had a group that I was happy with. A customary meeting held two weeks before the trip, at the Ferrymead Tavern to discuss travel arrangements to Manapouri. Paul Mason and Terry Crum made their own way. Neville Hammond transported most of the gear in his van, along with myself and Allan Burgess provided the necessary transport for four others. A range of lures for bluefin tuna was shown around the table and my ‘secret’ lure which was responsible for a 42kg yellowfin was produced by two other members of our party! Two weeks went quickly, an early morning shoot at Lake Ellesmere and I was a bit late in picking up Dougal at the airport. The afternoon was spent rigging lures, making groper traces and for me to complete my packing. Neville arrived to pack our gear in his van, so we could get away early the next morning. Keith and Neville ready to shoot a deer! Our ‘taxis’ was late and after picking up Steve Nolan, we finally left Christchurch at 7.30am. A brief stop at Rakaia and John Whisker joined us before resuming our journey south. Terry Crum from Christchurch and Ken Mitchell from Wanaka greeted us at the door of the cabin at the Manapouri Motor Camp. Inside a small fire warmed the cabin while outside the wind was almost reaching gale force and caused whitecaps on the waves on Lake Manapouri, clearly visible through the window. Our prospects didn’t look good. Paul Mason arrived late, just in time to join us for tea. In the morning the wind had died down and the sky overhead had cleared. But towards the south, the rugged mountains shrouded with clouds still looked dark and threatening. I cooked a huge breakfast with provisions brought at Te Anau, the night before. 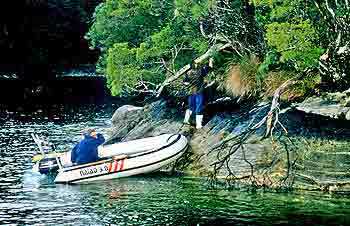 A short trip to the boat harbour and our gear was loaded onto two boats, the Fiordland Explorer and Paul Fishburn’s boat. An hour later, we reached the big steel structures of the Manapouri intakes in light rain. Many hands made light work as our gear was unloaded and loaded into Fiordland Explorer Courtesy Van’s trailer. Paul trailed his boat and we followed him through twenty-two kilometres of the road through the Wilmont pass to Deep Cove. We were treated to some amazing scenery – the dense rainforest, towering rock faces with spectacular waterfalls. 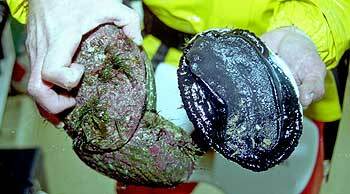 These paua (abalone ) were a welcome treat. Our home for the next six days, the Genesis anchored in the most idyllic settings. The tranquil waters of Deep Cove and a backdrop of steep, bush clad mountains that rose right out of the water and its peaks lost in the clouds. Climbing aboard, we couldn’t help but notice the vast arrange of fishing tackle that was made available for use. Including a couple of big Penn 80’s. a huge canopy covers almost the back deck with three zipped up transparent windows on each side. Something we got to appreciate in the very wet Fiordland rain. Some of the rods and reels were stowed below by Jason to make way for ours. Once underway, Brian, the skipper for this charter took us through the safety procedures and an introduction to his crew. Diana – the cook and Jason was the ‘deckie’. Skipper Brian and mate Jason secure a stern line to something “solid.” Necessary if you want to stay put during the night. The weather was slowly closing in, as we left the 22-mile long Doubtful Sound and the deepest. My Tuna lure was already over the side and was joined by three others as we headed out into the open rough seas, south to Breaksea Sound. I had given up watching my lure skipping through the swells and opt to sit in the cabin out of the wind. I was quickly brought to my senses as my reel alarm clicker sounded. In a few seconds, I was in my harness and gimbal, ready to do battle. My quarry wasn’t something from the deep, it was an unlucky Mollyhawk that nailed my lure from above. We secure a feed of Blue Cod in Breaksea Sound while Jason donned his wetsuit and poked around the shoreline. Arriving back with a couple of crayfish and a few paua’s. On closer examination, one of the crayfish had a reprieve and she was carefully released. Our first-night anchorage was in Beach Harbour, Brian uncovered a huge BBQ, complete with a wok, and deep-fried the battered freshly caught cod for an entree. I had produced another entree with the single crayfish, stirfry in Black Bean Sauce. Hamburgers completed our tea. Our only crayfish was used as wonton fillings – excellent! The morning’s silence was shattered with the engines starting up, an overcast day with light rain. After a huge breakfast, Brian took the Genesis II out for an early morning groper drop in the Passage. 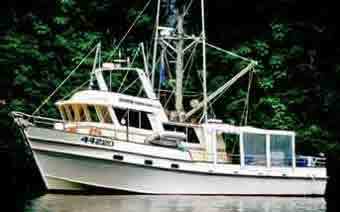 With heaps of fish showed up on the Sounder, our groper rigs for a 600 feet descent to the bottom. Two drifts later, we watched John ‘pump and wind’ his 37.4lb groper to the surface. Another drift, Allan and Ken were hooked into their first ever groper. 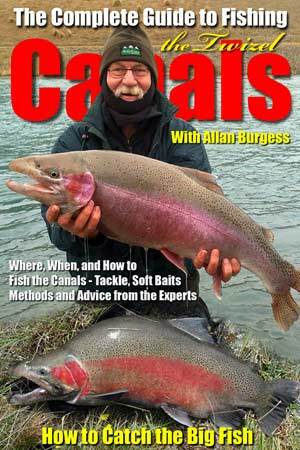 Allan’s groper weighed 24lbs and Ken’s fish pulled the scales down to 64lbs. Neville and I don our waterproof ammo gear for an afternoon hunt for a deer. Brian issued us with a radio and Jason dropped us off on a beach in Duck Cove. We found heaps of prints but its owners were long gone. The radio provided us with a mean to call the Genesis and to arrange our pick up. Diana and Brian prepared a huge meal, while Brian was cooking the thinly sliced paua on the hot plate, I added a few ingredients of my own, including a couple of nips of Chivas Regal salvaged from the Don Won. There were heaps of protest from the others. From the microwave, Diana produced another dish of paua’s in a white wine and cream sauce. I smothered the groper wings in Black Bean, garlic and ginger and cooked them in the wok. For those who were still hungry – a delicious venison casserole. Our third day and halfway into our charter, an attempt to fish in the open sea was abandoned due to heavy seas. Once again we were restricted to the sound. Several drops for groper proved unsuccessful. However we caught some huge Blue Cod, there was always plenty of Jocks and a few big dogfish to liven things up. 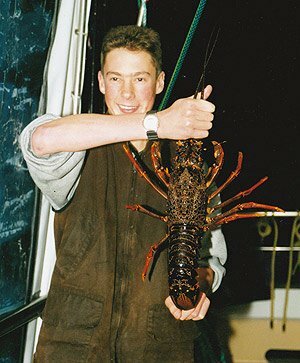 Allan Burgess with a groper – Fiordland, New Zealand. Diana provided us once again a huge range of food, fresh hot scones with jam and cream, pizzas, a cheese board with crackers. Gale force wind warning was in place for our area and Brian fearing the worst secured the boat with two bowlines and two stern lines in Wet Jacket Arm. I gave Diana a night off and we sat down to a meal of Sweet and Sour Blue Cod, stirfry veggies and steamed rice. Terry received bad news from home and Brian made plans for Terry to fly out in the morning. Our fourth day, Brian dropped the ropes to keep his rendezvous with the helicopter. The pilot made it look easy as he landed on the oyster boat fitted with a landing pad in one of Fiordland’s longest fiords (24 miles long). Half an hour later, Neville and I entered the bush for a morning hunt. There was plenty of signs, but this time I spotted a deer obscured by the bush, unable to get a clear shot and a few seconds later heard it crashing away from us. Once again the radio was put to good use, as I called up Brian and requested a water taxi. Later in the day, four-school groper ended in the fish bin, but the fish weren’t feeding proved very frustrating. A long line with twenty-five baited hooks were set before anchoring for the night and we had experience of the worst of Fiordland’s weather – heavy rain. In the morning, a further groper drop once again failed to produce any groper and the long line was nowhere in sight. Travelling to another underwater reef, the buoys were sighted. It had travelled almost three miles down the sound probably due to wind and tide. The first fish to the surface was a groper, this was followed a conger eel, two more groper, a green eye dogfish and a carpet shark. We have never seen anything like it, one of the groper were eaten from the inside out by lice – leaving just skin and bones. 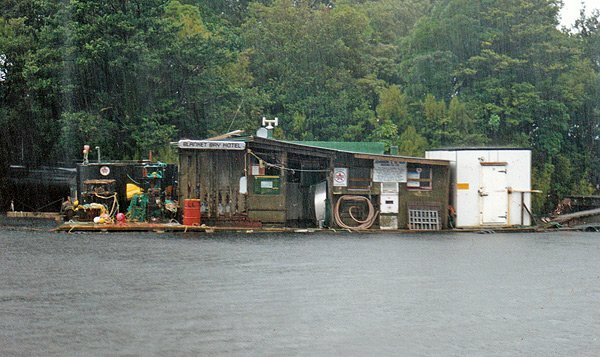 Brian made the decision to head for Doubtful Sound as the weather was deteriorating. A change of reels and I was trolling my tuna lure. It remained untouched for the three hours long trip through some very rough seas. These four groper were among the heaviest caught during our trip. There are few foods that can compare with fresh groper steaks especially when it is cooked to perfection, at anchor in a secluded Fiordland cove, by a very good chef! These fish were taken in the inner sounds and not in the open ocean where the sea was much too rough for us to try fishing for our target species southern bluefin tuna. 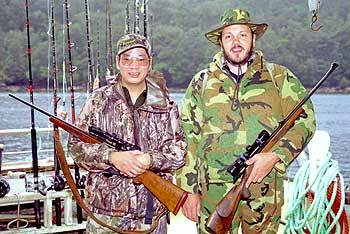 Our last day, Neville and I re-entered the bush, our last attempt to shoot a deer while the others had a fish for groper. The valley floor was to be an easy stalk but the wind changed on us and we elected to climb. The higher we climbed, the less sign we saw and before we knew it, we were running out of time. It was time to head back out. Putting the radio to good use, Brian had no problem in locating us. The last groper of the trip was caught by Dougal. Maybe it was the bunch of banana’s on the boat or the falling air pressure. For me, I’d had a most enjoyable trip. We would have liked to have caught an elusive Bluefin tuna but at least we were doing a spot of Fiordland deep-sea fishing. I didn’t manage to catch a groper, shoot a deer or even to catch a bluefin. The challenge is there and just maybe next year I will be back!